Summer SWEThogs is starting on Saturday, and I’m excited. I personally love running in in the Tucson heat. If you are avoiding running in the heat, here’s some items to consider that may help change your mind. Running in the heat is less efficient. It seems counter-intuitive to run less efficient, but in this case the inefficiency is helping your training by adding difficulty to your workout. There are a few reasons for this. One is that the body directs blood flow to your skin to help remove body heat. This is why people become flushed in the heat. Blood, and the oxygen it is carrying, that is being routed to your skin for cooling is not being directed to your muscles for propulsion, making you less efficient, adding extra load to your workout, which will ultimately make you stronger. The second reason it’s less efficient is something called “density altitude”. Density altitude is a concept I learned about when I learned to fly, and it’s something I love to geek out about when it comes to running. I’m surprised it’s not covered more as a running concept. As we remember from high school physics, as a gas warms up, the molecules become more energetic and spread out. This causes the gas to be less dense. It’s like going up in altitude simply because the temp is going up. This really affects airplanes trying to take off, but this also affects a runner in the heat. Every breath you take (cue the Police) has less oxygen in it, making us less efficient. 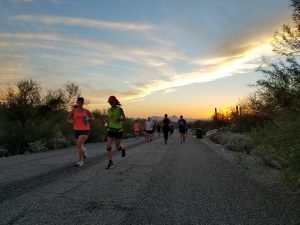 Tucson running and training is uniquely situated to be affected by density altitude. Tucson is at 2500 feet physical elevation, but only at 2500 feet density altitude when the temps are cool (59 degrees). As I write this, the temp outside is 81 degrees. I called the airport and the current density altitude for Tucson is 4800 feet. Add more heat (May or June) or more altitude to the equation (I’m looking at you, Oro Valley), and the effect is greater. When it’s 95 degrees outside, it may be over 6500 feet. Essentially, we get altitude training without having to leave home in the summer. The low humidity in Tucson means that our sweat cools us more effectively than it would someplace with an 80% humidity. We can run comfortably in Tucson in 90 degree plus temps because our sweat actually evaporates, rather than just drip off of us. I think many Tucson transplants from back east lose sight of this and avoid summer running because they remember how miserable summer heat and humidity can make them. The need to deliver all that sweat in the summer causes an increase in blood plasma volume. This will cause a small weight gain in us, but its additional volume will cause your heart to have to work harder which will help increase your cardiovascular fitness. Hot weather running is harder. As runners, sometimes we need to do hard things not just to strengthen our bodies, but to strengthen our will power. The mental toughness we get running in the heat is invaluable when we are having a bad training session or a tough race. All of the above problems instantly disappear when you travel someplace cool at sea level and race, but not the additional strength you gained from the heat. That Rock n’ Roll San Diego or any of the coastal events will feel so much easier because of your heat training. Running in the heat is safe when we properly acclimatize ourselves to the heat and pay attention to proper hydration and electrolytes. Our SWEThogs program will start you with an easier base and build you up as the temps climb, giving us plenty of time to acclimatize. I’m looking forward to sweating with you this summer!